I love people and business. You probably realize this, based on the fact that I formed a consulting firm to help build manufacturing performance using a blended data-driven and people-focused approach. So, freshly inspired by an article called “You’ll never have a sink full of dirty dishes if you follow Toyota’s productivity secret”, by Manoush Zomorodi on LinkedIn and Quartz.com, describing an old-tech approach to productivity, I decided to write about a famous, effective, and very old-tech model for engagement. Models tend to be rooted in relevant, key fundamentals, thereby simplifying effective processes and making them repeatable. I believe you’ll agree that this is an extraordinary model and look forward to your comments. Employee Engagement is emotional. It’s a strong desire to do your job because you find meaning, a sense of purpose, and joy in doing it. Why? Because it leverages your highest skills and knowledge, provides opportunity for desired growth and creativity and contributes to something significant and important to you. It makes sense that a model centered on understanding emotional drivers of human behavior at work, aka motivation, would be highly useful to leaders who want to bring out the best performance in their people to achieve the business strategy. The famous low-tech model for building engagement and business success is Maslow’s Hierarchy of Needs. While much has changed in our world, the core needs of people remain the same. Just as the Toyota Production System has old, tried-and-true practices, so does this model. 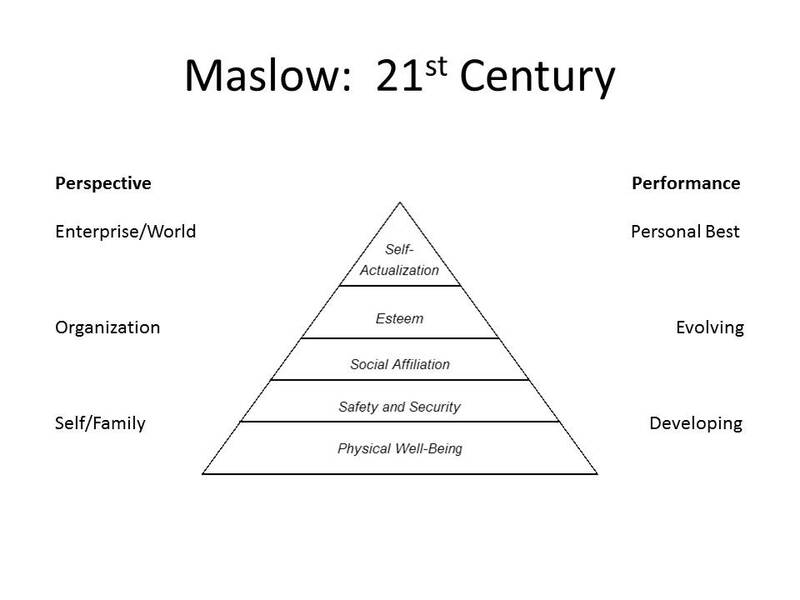 This photo provides an expanded perspective on Maslow’s amazing and insightful work. Let’s review it briefly. Center stage you see the Pyramid many of us studied at some point years ago. Left: you see how an employee’s focus shifts as needs are met and ascend the hierarchy. Right: you see how employee performance is impacted as his/her needs are met at higher and higher levels of the hierarchy. Today, Self-Actualization = Engagement. Experience shows that the best way to leverage Maslows’ Hierarchy is for managers to apply it both individually and organizationally, using a systems approach. A systems approach works because it enables us to set up processes and practices to occur routinely, vs. requiring managers to create and re-create these practices daily. Following are examples showing how the Model can be applied using a 2-step methodology. Step 1: The management team applies the Model to the entire organization, starting at the base of the pyramid or hierarchy and working upwards to Self-Actualization or Engagement. This sets a foundation company-wide. Using a systems approach, managers as a group review each level of the pyramid starting at the base level, and asking themselves: What can we do to meet people’s needs? Physical Well-being, also termed Survival, is the first level of the hierarchy. Most employed people are already meeting this need, already able to provide themselves and their families with food and shelter. Therefore, organizations tend to begin with the second tier, Safety and Security. A strong safety program with precautions and training that prevent injury and work-related illness. 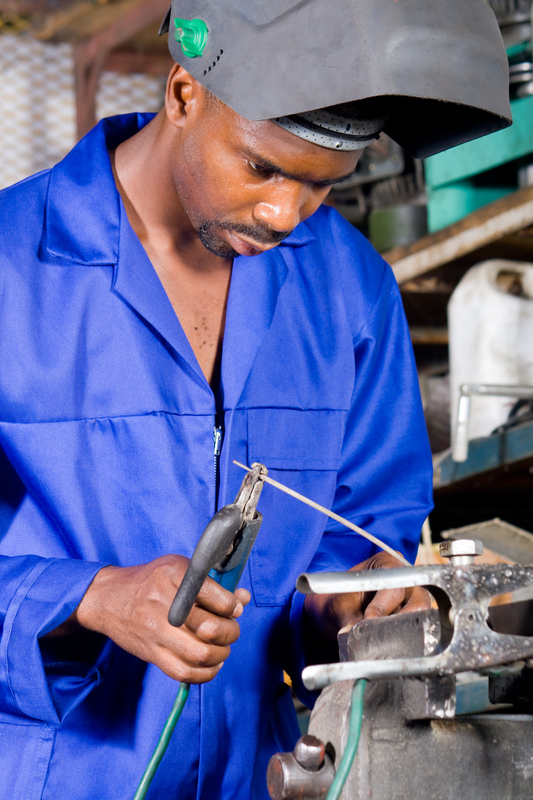 For a manufacturing area, examples include machine guards and tools and work procedures that not only suit tasks but also prevent repetitive motion injuries; protective clothing that is always accessible for handling chemicals; equipment to facilitate lifting of heavy objects; training that ensures employees are proficient in safe work habits, as well as monitoring and communication about safety priorities and performance results. Company policies that guide employment actions and fair employment practices i.e. hiring, termination, promotion, layoffs and severance. Effectively designed and administered policies, communication and easy access to written policies and to people who can answer questions are examples of systematic solutions. Step 2: Managers and supervisors focus on meeting specific needs of their individual employees. Here, managers can, systematically, tailor their leadership practices to bring out the best in their people day by day. Each manager needs to get to know his people in order to understand their individual needs. Managers can do this by observing how people work and talking with them one-on-one during business hours. This is essential in order for a manager to tailor his management practices to meet employee needs using the Model. The third tier of the hierarchy is Esteem, which is about a person feeling self-confident in his knowledge, skills and abilities as well as knowing he is valued and respected by others who have confidence in his knowledge, skills and abilities. When an organization’s leaders make it a business priority to lead and manage using Maslow’s Hierarchy, the culture and supervisory practices can then be aligned to provide an engaging work experience for people across the organization. A systematic approach to engagement enables managers to, in a time-efficient way, establish their practices in accordance with Maslow’s Hierarchy company wide, departmentally, and individually. Without a systematic approach managers often become overwhelmed by having to re-create the wheel constantly. A systematic approach enables these practices to sustain themselves as repeated habits and traditions, not unlike our society’s celebrations of holidays, community events and family traditions. Maslow’s Hierarchy, applied systematically to groups and individuals, is a recipe for successful employee engagement. Sometimes it’s revolutionary to go back to basics. We believe this model, which has been proven effective for decades, can enable breakthroughs in building and sustaining employee engagement — benefiting people by helping them to love working at their jobs and helping businesses to achieve and surpass their own expectations. Would you like a simple, proven-effective tool designed to help you to engage your people? Today’s technology makes it easy to learn more about how this model works. And, a (very) few consultants could also help. What is Disengagement Costing Your Company? ← What is Disengagement Costing Your Company?